ITHURIEL'S INTERVIEWS. NO. X.—COL. W. F. CODY ("BUFFALO BILL"). "EARL'S COURT!" shouted a stentorian-voiced guard, as our train drew up in the station; and as it was for Earl's Court that I was bound, I took the hint, and turned my steps Buffalo Bill-wards. Through miles of corridors I pursued my devious way slowly under thousands of artificial grape-vines, which bore no prospect of an early harvest; past dozens of people who were drinking tea from thick cups placed on bare boards and tin-topped tables, out into the camp of the Wild West. It was raining; a quiet, penetrating sheet of water was soaking incontinently through my ancient garments, and percolating down my ancient back; but like Cain I wandered on, past Indian tepees, past the log cabin where Major Burke ("Arizona Jack") nobbles the press-gang; past the tent where Miss Annie Oakley, surest of shooteresses, was resting after her afternoon labours, until I reached the spacious tent of Buffalo Bill, in which den I had before bearded this lion of the prairies. The place was tenantless, but I knew that this was Liberty Hall, and had experienced the Western hospitality of the renowned William, so I played the host, and invited myself to take a seat. Having accepted the welcome invitation, I asked myself if I might look about me, and see what was to be seen till the show was over. Most gracious consent being given, I gazed upon the skins which covered the floor, and bore testimony to the skill of the famous hunter. Then I took stock of the photographs scattered about in reckless profusion. 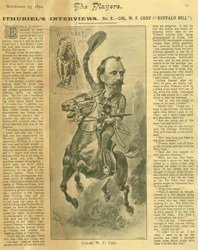 Here were scenes after the battle of Wounded Knee, with the blank dead faces turned from the snowy ground to the frozen sky; pictures of the fighting chief Kicking Bear and his staff; a drawing of Buffalo Bill, in his hand the scalp of the still writhing chief Yellow Hand, whom he slew in single combat. Then turning from these I noted the march of civilisation in photographs of this remarkable man and his Indians in gondolas in the watery highways of Venice, in the Colosseum at Rome, in the famous Arena at Verona, and beneath the smoking crater of Vesuvius. These are the changes which this man—this still young man—has seen. And yet there are people who tell us that the world [drawing] THE WILD WEST IN LONDON Oliver [Daque?] SWAIN FC Colonel W. F. Cody. does not progress. It may be that the Indian was better off scalping white men on the Western prairies than being photographed in Rome, that Buffalo Bill was happier scalping Indians than hiring gondolas, but I have my doubts of it, and I was comparing these two very different episodes in the life of my subject when he entered the tent like a tornado. Buffalo Bill was wet, and he was going to remain so for the shortest possible space of time. Once he would have slept in those dripping garments, but why should he now, when he has dry ones? I don't know. Do you? Having donned other raiment, he gave me kindly welcome in true Western style by a shake of my hand with one of his, while the other rummaged in his vest pocket for a cigar by which to seal the welcome. "And so you are going to leave us for ever, Colonel?" "Hardly that. I hope not. I hope to see this dear old country again often before I pass in my chips; but I shan't come again as a showman, that's all." "Are you going out of the show business entirely?" "Just as soon as I am through with the Chicago Exhibition. That will wind me up as a showman." "How long have you been in the show business?" "Twenty years—ten of them in the theatres, and ten with the Wild West." "How did you happen to drift into the business?" "Well, you see, Ned Buntline wrote a piece—at least he called it a piece—that was founded on some of the incidents of my career, and he thought if we got some Indians and showed them in the theatres something of the life we lived in the Far West, that some people might be interested in it. So we tried it." "Well, it seemed as though, instead of a few people being interested, the entire population of every city we went were waiting for us. We filled the biggest theatres in the country, and could have played to twice as many people if we had had room for them. You think I am stretching the story?" "No, I do not. I have heard enough of what you are telling me to believe every word you say. Could you act?" "I didn't try to act. I did what I used to do on the prairie, not what I thought some other fellow might have done if he felt that way."